Scientific Warmth Ratings Guide Families on Outerwear Choices | Lands' End, Inc.
DODGEVILLE, Wis., Oct. 17, 2018 /PRNewswire/ -- Bundling up means something different in Seattle versus Sarasota. 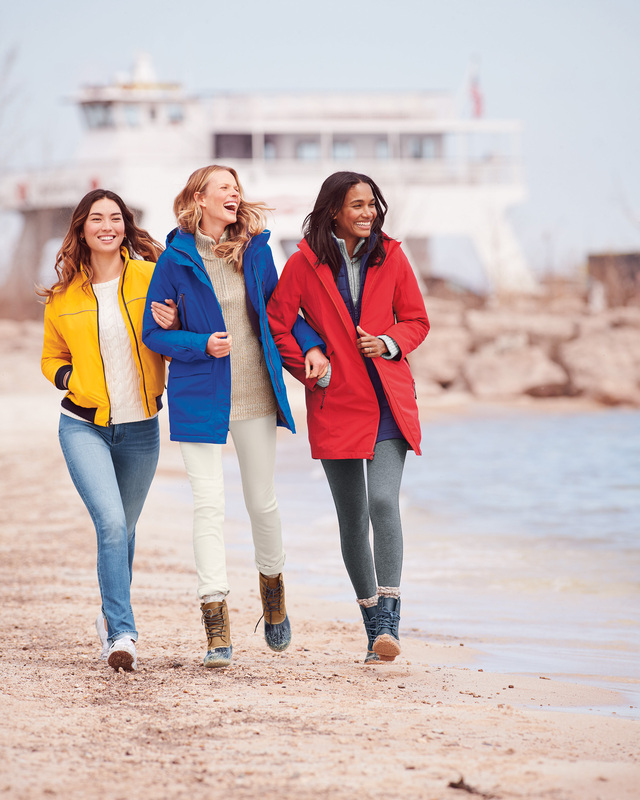 Lands' End, a recognized authority in outerwear, created scientific warmth ratings to help consumers find the most comfortable option fast, wherever they may live. The three ratings—Warm, Warmer and Warmest—give consumers a quick way to evaluate the brand's endless selection of vests, bombers, coats, jackets, and parkas, so everyone can feel warm and cozy all season long. "Whatever the weather, families can be confident our outerwear is winterproof," says Gill Hong, EVP, chief merchant and head of international at Lands' End. "We temperature-test each outerwear style using an exclusive model we first introduced more than a decade ago, so you can be sure the ratings you see on our website or in the catalog are exactly how a jacket or coat will perform in the real-world environment." Here's a look at how the temperature ratings work. The process is different for grownups than it is for kids. Using a method first introduced in 2006, a TIAX Instrumented Manikin called TIM, a 5-foot, 11-inch manikin with copper skin, comes equipped with sensors that measure temperature. Wearing a typical everyday outfit (like a shirt, sweater and jeans) along with a Lands' End outerwear piece, TIM gets placed inside a test chamber where testers deliver electrical power to the wires in his copper "skin" to maintain a temperature of 35 degrees Celsius (about the temperature of your skin). Then they measure the power required to keep that "body temperature" constant as the chamber temperature is lowered. Using the results of the test and a unique formula developed by Lands' End, the testers arrive at the outdoor temperature range in which someone can expect to comfortably wear the tested jacket, parka or coat. Kids' outerwear is tested in a different lab using methodology calibrated for the metabolism of children. The Sherpa Fleece Jacket is becoming a family favorite for its soft, cozy warmth. It can be worn indoors or out. It also makes a great layering piece underneath outerwear. A perennial favorite that takes you from fall through winter to spring is the Down Vest. The 600 fill power down provides weightless warmth, and because it's HyperDRY™, the down retains its loft (and warming power) even when wet. A water-resistant finish sheds light precipitation. The vest comes in a wide variety of colors and patterns for men and women. The Squall® Parka is the "go-to" coat for men (-9 to +14 degrees F), women (rated -16 to +9 degrees F) and kids (rated +4 degrees F and warmer). Lands' End improved the Squall Parka this year to be practically weatherproof. Its nylon shell not only resists wind and water, but it's seam-sealed to be waterproof. The upper body is lined with soft fleece for added warmth on frigid cold days. For warmth without the weight, the Ultralight Packable Down is ideal. It fits just about everybody because it comes in a wide range of sizes, including tall and plus petite. The warmest winter coats are Wisconsin-proof. Lands' End designers, based in Dodgeville, Wis., endure days when sub-zero wind chills combine with flakes quickly falling. The Expedition Parka, available for men, women and kids, is just for those days. Built with extreme-weather features, this parka merges function, style and versatility. It's completely waterproof with 600 fill power down that maximizes warmth, minimizes bulk. The interior knit cuffs stop cold from sneaking in. To keep warm in cold, snowy areas, outerwear features such as a windproof shell and waterproof seams take priority. When winter hits its peak, the Down Fur Hooded Coat for women and the men's Rusk Parka (temperature rated -54 to -21 degrees F) are ideal. The Down Faux Fur Hooded Coat is warm to -45 degrees F. Inner rib cuffs keep warmth inside and cold outside. The men's Rusk Parka is durable, functional and surprisingly lightweight thanks to 600 fill power down. For extra help blocking the elements, our down parka sports an outer storm flap and drawcord at the waist. Like all Lands' End products, outerwear and accessories are Guaranteed. Period.® To see the complete outerwear and cold weather accessory selection, visit landsend.com/outerwear.